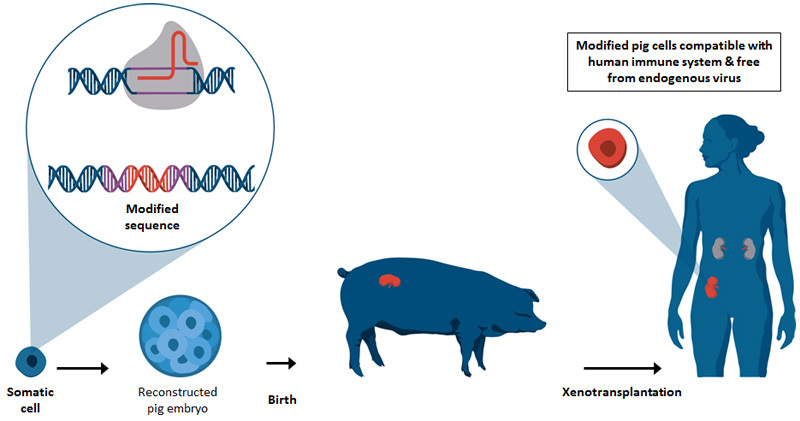 CRISPR technology was used to remove potentially dangerous viruses from the pigs’ DNA. We have a huge supply and demand problem when it comes to organ transplantation. Closing that gap with animal-grown organs is an idea that's been on the table for some time, but it comes with a slew of issues that have prevented it from being a viable option. Pig organs are the right size for human transplants and are similar enough to our own, but pigs have viruses embedded in their DNA that could potentially infect humans and cause serious harm. However, a new study out today in Science shows that with the gene editing tool CRISPR, those viruses can be removed, bringing pig organs one step closer to human bodies. While patients that have received treatments made from pig pancreas cells and pig skin haven't contracted any porcine viruses and some researchers think that they don't pose a major risk, this study showed that the viruses were able to infect human cells in vitro, which could then infect other human cells. So, while it's unclear how threatening these viruses are to humans in practice, they do at least have the ability to jump to humans. To get around this problem, the researchers used CRISPR-Cas9 technology to snip out the viral DNA from the pigs' genomes. These edited cells were then used to create embryos that were implanted into sows and the birthed piglets were born virus-free. The study reports that 37 piglets were born and 15 are still alive. The oldest piglet is four months old. It's not yet clear whether the survival rate is impacted by the gene editing and the research team is following the animals to observe any long-term effects. The group is planning to combine this method with a similar one that would make transplanted pig organs less susceptible to human immune responses. eGenesis founder George Church, a leader in the CRISPR technology world and an author of the study told Scientific American, "I generally hesitate to say we've solved a two-decade-old problem, but in this case, we have." And he's said that pig-to-human transplants could happen as early as two years from now. But David Sachs, a Columbia University professor, is a little more cautious about those predictions. He told the New York Times, "I am afraid that he may find these goals more difficult to achieve than he expects, but I would be happy to be mistaken."